Round 2: Nankervis selling candy Toby Nankervis shows great movement and composure in the dying minutes of the final term against Collingwood. The instant impact Richmond’s new No. 1 ruckman Toby Nankervis has had in the Tigers’ line-up, is further highlighted through an interesting individual statistic emanating from last Thursday night’s clash with Collingwood at the MCG. Nankervis, playing just his second game for Richmond after transferring from Sydney during last year’s AFL trade period, had the most contested possessions by a Tigers ruckman in a match since 2003. The 199cm, 106kg, 22-year-old had 14 contested possessions (21 disposals all-up) in Richmond’s 19-point victory over the Magpies. He also finished with an equal team-high seven clearances, six inside-50s, three rebound-50s, five marks and 18 hit-outs. In terms of contested-ball numbers, you have to go all the way back to Round 17 of the ’03 season to find a better performance by a rucking Tiger. That’s when Brad Ottens had 18 contested possessions in a match against the Western Bulldogs at Etihad Stadium, which Richmond won by 60 points. 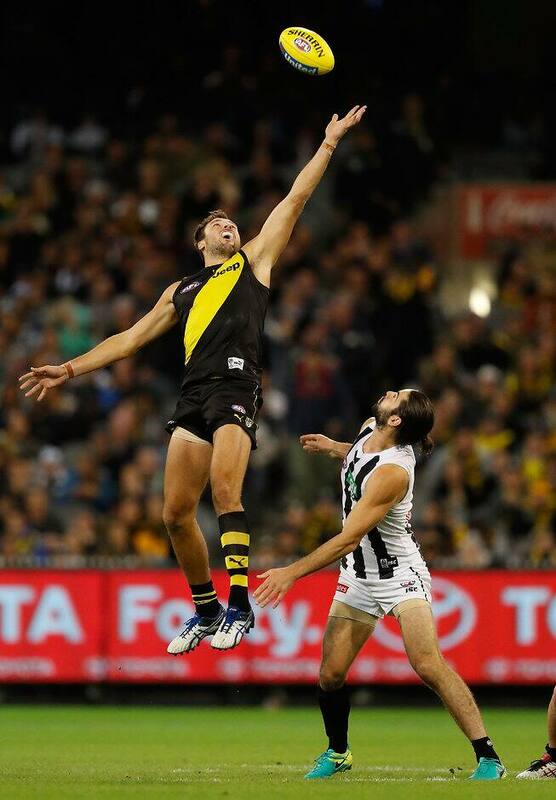 Nankervis’ top-class ruck display last Thursday night earned him high praise from Tiger teammate Shane Edwards. “He was on fire,” Edwards told ‘K-Rock’ post-game. “He’s got a nice left foot as well for a ruckman, so that’s come in pretty handy for us. “He’s a combination of being good in the contest, he’s got quick hands for a big guy, and he’s also good on the outside when we get it to him. “He’s not quick, but he can use it by foot. “He’s a smart guy as well, so he’s always in the right places.